Over the years I have been doing make-up artistry, one of the most important elements when completing a look and then taking the perfect shot for my social channels is lighting. Great lighting – or the absence of it – can make or break a final beauty look. I definitely find that social media shots register more with my audience if the lighting is flattering, particularly on the skin and under the eyes. Sometimes it’s hard given the location, timing plus a few other elements, however with all my experience I have found some great tools and lighting tips to create the perfect make-up shot. TIP 1 Pick the right time of day I find the best shots are when the light is directly on the face and when the sun is not too high – mornings and afternoons are generally best. Tip 2 backlighting is not your friend Particularly for make-up shots, as it’s really not as flattering. If you are inside with lights on, make sure the lights are pointing toward your face and are not directly above you as this will create dark shadows under your eyes. I find that when I’m on-set at a beach in the middle of the day (while the sun’s high) it’s difficult to get a good make-up shot. Tip 3 Use a camera with some in-built tricks Rather than using your smartphone, experts go for a great point-and-press camera with a flip screen and high resolution screen so they can see the shots as they’re taking them, then review the set quickly afterwards. For that reason, I love the new Canon Powershot G7X camera I picked up just before I headed to New York Fashion Week last month. It is easy to use and has a Wi-Fi button on the side that means the photos can be sent straight to your phone if you have internet access. 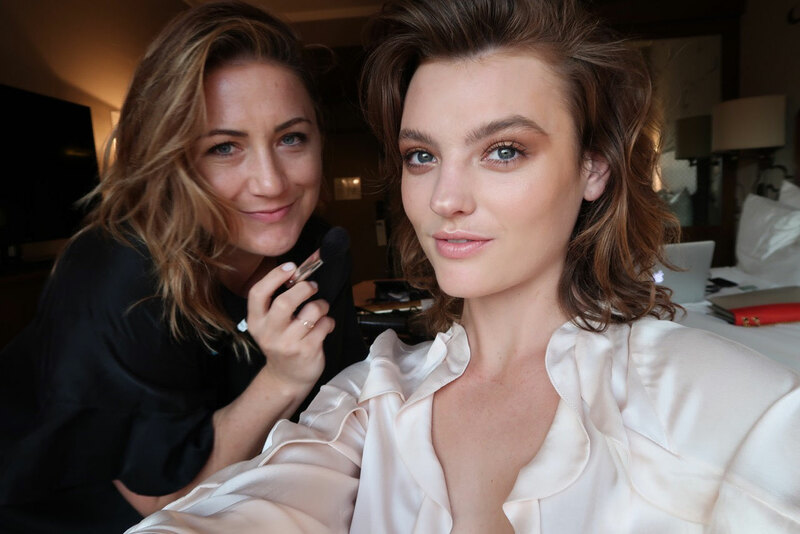 That’s the camera I handed Australia’s Next Top Model winner Montana Cox, whose make-up I did before a gala event in New York last month during fashion week, for the fantastic pics in this story. She’s a stunning subject, but the process behind these selfies is perfect for showing off the make-up too: afternoon light streaming the hotel window at The Soho Grand. Point made! Follow Tobi on Instagram. All photos courtesy Tobi Henney and taken on the Canon Powershot G7X.